Most file sharing in businesses is done through email, which clogs up your mail server and multiplies versions of files confusingly. SharePoint is a runaway success, but there are plenty of alternatives that don't require you to run your own servers (or find ways of making them available to external partners). Most file sharing in businesses is done through email, which clogs up your mail server and multiplies versions of files confusingly. SharePoint is a runaway success, but there are plenty of alternatives that don't require you to run your own servers (or find ways of making them available to external partners). Consumer cloud file-sharing services like Dropbox are increasingly popular, but often have security concerns. Egnyte is trying to offer the best of both worlds: cloud file sharing with management options that can synchronise files from users' PCs automatically and work in combination with a Netgear NAS or VMware Appliance for on-premise storage, or share files from Salesforce. The Egnyte service is available in various packages, from 150GB up to 16TB. Pricing includes a fixed number of both Power Users and Standard Users. If necessary, you can pay for more power users who can sync a specific folder from their PC to the cloud service and get offline access to their choice of folders shared by other users. Standard users get web and FTP access to the shared folders an administrator gives them permission for. You can't add more, but you get a large number with most packages and this level of account is designed for sharing files with external partners and clients, so you may be able to reuse accounts over time. The simplest way to create users is to link to your Active Directory; Egnyte supports other single sign-on services, or you can create users individually. 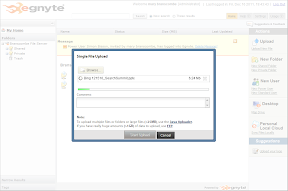 Even if you're not integrating with local storage, getting started isn't as simple as setting up your users and pointing them at the Egnyte web portal, which is as clear to use as any other web-based file explorer. If you want to upload or download more than one file at a time through the web portal, you'll need to run the Java client or install an FTP client and connect through that. It's good to see an efficient transfer protocol like FTP still supported, but it's not necessarily a user-friendly option (it would make Egnyte a good way of migrating from an existing FTP solution to something easier to work with). Mapping a drive involves downloading an installer and a separate notifier, and then filling in your login details on a local web page; this creates a drive mapping in Explorer (and a shortcut on your desktop for some reason), and the process doesn't feel particularly slick or confidence inspiring. If you want to sync files rather than copying them back and forth from the cloud by hand, you have to install a third app, which includes the Growl background agent for notifications, run a web server, and possibly modify firewall rules. And despite having local software running, you have to open a web page from that local server to change your settings (it's not clear why those aren't integrated on the main web portal). If your desktops are locked down, this means more work than a pure cloud solution and a local web server isn't something every security policy allows for. Mapping the Egnyte cloud should be very useful, letting you drag and drop files into the cloud as if it was just another folder, but this only works correctly if you put files into the Shared and Private folders, not in the top-level Local Cloud folder that appears as a mapped drive and a pinned location in Explorer. Initially, we had problems with files not syncing because they were at the wrong level in the local cloud folder; the email reported the sync had worked and the sync log was labelled 'OK', but clicking through showed the files had been skipped. It would have been far more useful not to be able to create files at that level of the folder at all. Open or download a file from the web portal and you get a reminder that you'll have to reupload the changed file when you're done. If it's in a synced folder, we expected this to happen automatically, but that didn't work if we clicked the Save button in Word — only if we explicitly chose Save As and picked the original folder, which makes this rather too much work to be useful. The local folder doesn't keep multiple versions, but you can retrieve two previous versions of files from the web portal (administrators can change the number of versions kept) and you can get a link to the online versions by right-clicking and using the Egynte menu in Explorer, but not using the Windows Previous Versions dialogue. 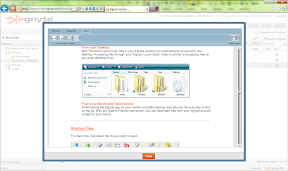 You can share a file by putting it in your Shared folder; you can also share a link to the file from the web portal (choosing Share a Link from the Egynte context menu opens a link to a mail form on the local web server rather than an email in your preferred mail client, and you have to know the email address you want rather than being able to look it up). 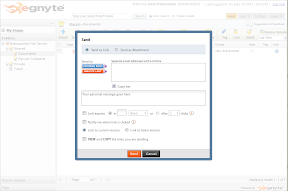 Shared files can be public, allowing anyone to see them, or private and only available to users with Egnyte accounts. A link can expire after a certain number of days or after it's been clicked a set number of times — a useful touch that lets you limit access the way you choose. Again, the administrator can choose a default timeout. You can add notes and tags to files through the web portal — you'll need this as the search is basic, looking only at file names and the content of text files. There's a simple Flash-based previewer on the web portal for document and image files, to check if you have the right file or copy a paragraph of text out quickly, but it was slow and we had problems viewing some PowerPoint files through it. You can also view files using mobile apps for iOS and Android (but not Windows Phone) and upload pictures, videos and text files or send shared file links to colleagues. The Egnyte service is very chatty; you get on-screen notifications for just about everything (including, for admins, every user logging in), and emails letting you know not just when there's a file shared with you but almost every time a file has been accessed, or when a sync has happened. You can turn these off, but as the reports on the admin portal are sparse to the point of terseness you may not want to. It's easy to see how much storage space files are using, but the only report that tells you who's accessing what files is an audit report you have to wait a few minutes to have compiled — and again, the details are sketchy. You don't need to worry about per-user quotas as the storage is shared between all users, but that may make it even more important to see who's responsible for larger files. Enterprise and cloud file sharing are both crowded markets and it's hard to stand out. The NAS option is interesting, but limited to Netgear hardware, which makes it less attractive. 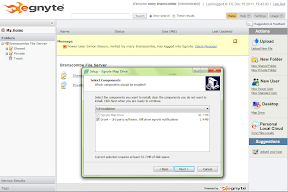 The sync options and connections to various storage systems and services make Egnyte more than just another cloud sharing service, but you could get a similar mix of file sync, cloud storage and easy access for external partners using Microsoft Office and SharePoint Online, which would give you full-fledged document editing with the Office Web Apps rather than just file preview. If you're just looking for a business-grade file sharing system in the cloud, Egnyte is an interesting option, but it has more rough edges than we're comfortable with, and being a cloud service is no excuse for having a confusing and clumsy way of getting set up on the desktop. Administrators with experience will quickly master Egnyte, but less experienced users will need to understand the system first and we'd like to see this get rather simpler than it is today.